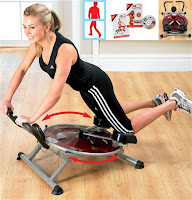 Burn off all those calories and keep in shape with our extensive range of fitness equipment. Looking for something a little bit different? Take a look at this fantastic Ab Circle Pro! Lose your love handles, slim and tone your bum, hips and thighs. Friction free track allows you to pivot your body to work ab muscles. Three resistance levels, folds up for easy storage. Includes a 3 minute express workout DVD and nutrition guide.